An ideal blend of economy and performance, this Rutland Professional's Choice 50 Round Poly Chimney Cleaning Brush is a must have for any chimney service professional. 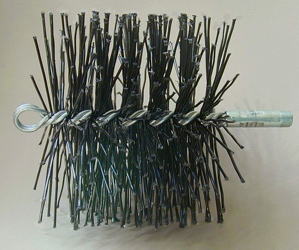 The Prostran polypropylene bristles allow this chimney brush to maneuver easily in prefab chimneys and effectively clean zero clearance flues from the bottom up. A durable single-spiral spindle and heavy-duty plated 3/8-inch thread double-swaged fitting also mean that this Rutland chimney brush can easily handle regular professional use.